After studies in Munich, Vienna, Detmold and Paris with Professors Gerhart Hetzel, Wolfgang Schneiderhan and Young Uck Kim, Michael Friedrich passed his state examination in 1987 with special honors. Solo and chamber concerts in Europe and Japan (including with the Bach Collegium München, Leonard Hokanson, Kurt Guntner, Hansjörg Schellenberger, Young Uck Kim) and radio recordings followed. His particular interest in contemporary music is shown by his participation in many original performances, such as at the Münchner Biennial or the “Musikbiennale Berlin” with the “Xsemble München” and “Ensemble für Neue Musik München”. In 1984 Michael Friedrich received a prize in form of a grant from the Ida- and Albert-Flersheim foundation in Lucerne; in 1988 he was awarded the artistic prize of the town of Schrobenhausen. 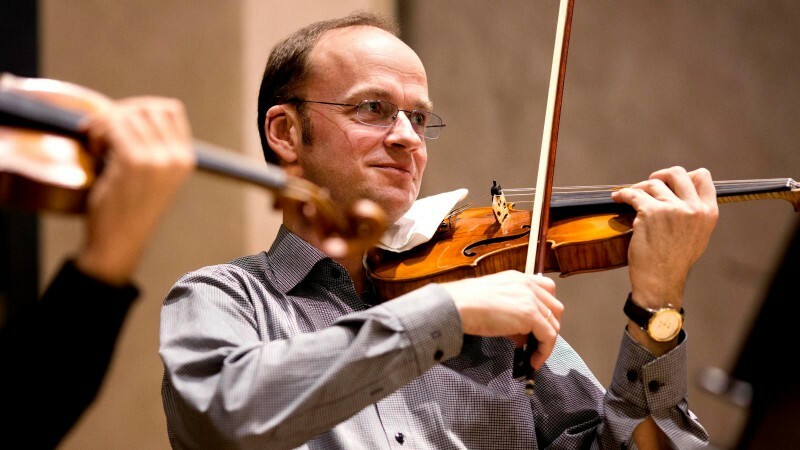 Since 1989 he has led a violin and chamber music course within the framework of the summer academy for music, performing arts and theater in Neuburg on the Danube. In addition he often acts as a member of the jury at competitions (such as the “Jugend musiziert” youth music competition) and also engages in teaching. Since 1994 Michael Friedrich has been the leader of the “Grieg Quartett” in Munich and since 1990 has been a member of the first violin section in the Symphonieorchester des Bayerischen Rundfunks.